Hydrangea Flower Stickers – Add a Photo! Want to let everyone know how much you love blue hydrangeas? Add some pretty blue flowers to that envelope before mailing – and add a photo of yourself, the new baby, or family pet! It’s easy if you use a photo template sticker. It seems that everyone loves to give (and receive) personalized gifts. 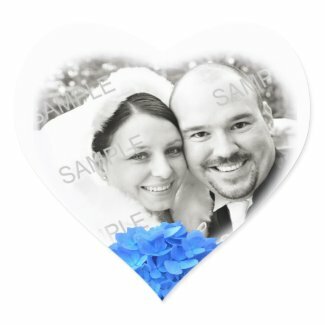 The online company –Zazzle.com – where I have a hydrangea based stationery shop, is well known for it’s personalized and customizable products. Just about every item they sell, from stickers to skateboards, can be made uniquely yours with customization. Templates for text and even for photos let the consumer easily create a one-of-a-kind item for themselves or to give as a special gift. Of course there are also many other types of hydrangea stickers. Next Post Too Late To Garden?